The goal of MTLR is to provide an R implementation for Multi-Task Logistic Regression. In addition to supplying the model provided by Yu et al. we have extended the model for left censoring, interval censoring, and a mixture of censoring types. 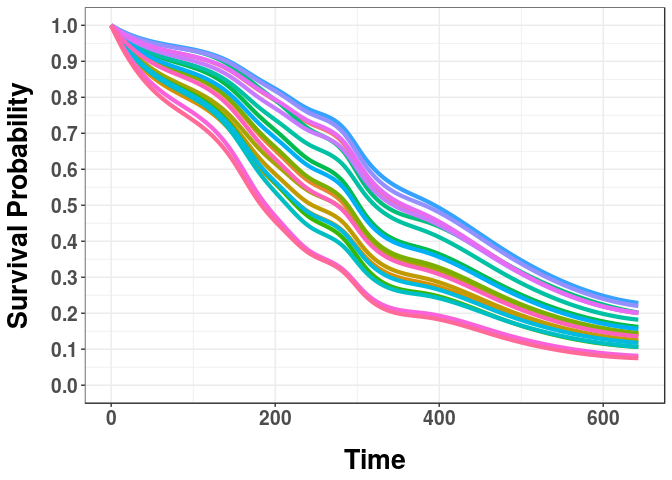 Functionality includes training an MTLR model, predicting survival curves for new observations, and plotting these survival curves and feature weights estimated by MTLR. 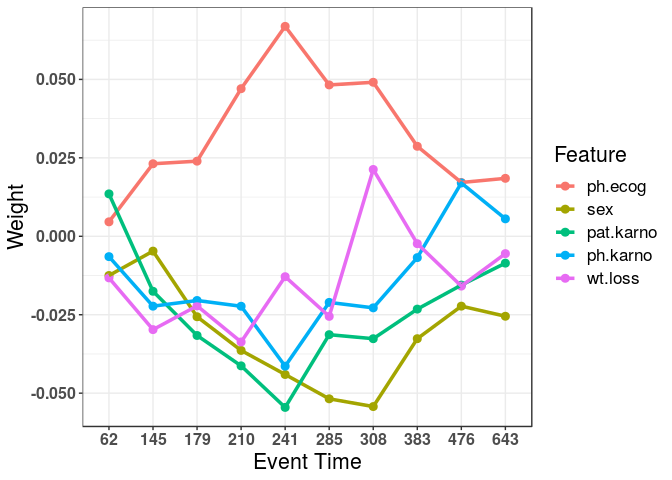 # Load survival for the lung dataset and the Surv() function. #Here we will use 9 intervals (10 time points) just for plotting purposes. #The default is sqrt the number of observations. Added an option to optimize concordance instead of the log-likelihood when selecting a value for C1 in mtlr_cv. Removed ellipses from create_folds since it's easy to use type instead of foldtype when passing in arguments. Fixed a bug where if all data was left or right censored an error was thrown since there was no interval censored data. mtlr_cv output is not best_C1 and not bestC1 to match the documentation. Removed usage of Rcpp data structures inside MTLRHelper.cpp. This was not needed and just wasting time when transferring them to armadillo structures. A number of printing fixes were made, e.g. printing out all variable names at once instead of one at a time for warnings and actually printing results when verbose = T for mtlr_cv. When biases are trained they now assume the data are uncensored.